“The spiral staircase leads to my secret batching room where I mix up the family recipe,” says Fielding Rogers, CEO and great-great-nephew of G.L. (Lee) Wainscott, founder of the Ale-8-One Bottling Company. Begun in 1902 in Winchester, Ale-8-One remains the oldest, privately held bottler in the United States still owned and operated by the founding family. It is the only soft drink invented in Kentucky still in existence. Rogers is a fourth-generation family member to run the business, appointed at the age of 28 in October 2009, and was later named CEO in 2013. Every Ale-8 that is sent out into the world originates in small batches from his hand. In the beginning, Wainscott bottled flavored soda waters that he called Wainscott’s Flavors, and in 1906 he launched Roxa-Kola—named after wife Roxanne—a popular rival to the cola drinks of the day. The first longneck returnable bottle appeared in 1949 bearing the familiar Ale-8-One shield with the company’s first logo inside. Today, fans simply refer to the drink as Ale-8. “It’s a powerful legacy that I take seriously, and I am very protective of the ingredients. I still have the original notes in Uncle Lee’s handwriting,” says Rogers. With the family-owned company competing with industry giants, Ale-8-One strives to stay relevant. In addition to the Ale-8 Original, there are two other varieties: Diet Ale-8, introduced to loyal fans in 2003, and Caffeine Free Diet Ale-8, which debuted in 2011. The only new flavor to be introduced since the Original is Cherry Ale-8, which launched in April 2018. The company also taste tested the final recipe with numerous Ale-8 fans before production started. “Uncle Lee had notoriously high standards, and we feel sure he would be proud of what we have created with Cherry Ale-8,” says Rogers. “It’s made using real cherries, real sugar and no artificial colors.” A 12-ounce serving has 120 calories. Cherry Ale-8 was added to the Louisville market in January, and the company has plans to distribute to other areas soon. One naturally expects the CEO of the company to be a huge fan of Ale-8, but it’s interesting to hear which are his favorites. When asked about Ale-8-One’s devoted fans, Rogers shares the following story that demonstrates how beloved Ale-8 is. Ale-8-One is a partner with many groups in the state and in their local community of Winchester. The company is dedicated to the environment and its employees, and also supports military stationed overseas by donating the product with the person paying only for shipping. For a number of years, Ale-8 has worked with environmental non-profits and 1% for the Planet to give back 1 percent of longneck returnable glass bottles and tallboy can sales. “Our partnership with 1% for the Planet allows us to directly help the Red River Gorge, a beautiful Kentucky sanctuary, and all those who enjoy it,” says Rogers. • Free tours are offered at the Ale-8-One Bottling Company. They are 45-minutes in length, for all ages, given on Thursdays and Fridays at 9 a.m., 10 a.m., and 11 a.m. Reservations required; sign up online or call. Every guest receives an ice-cold Ale-8 in the famous green, longneck returnable glass bottle at the end of the tour. • All glass varieties of Ale-8-One including Diet Ale-8 and Cherry are produced in the Winchester plant, where they employ just over 100 full-time employees. 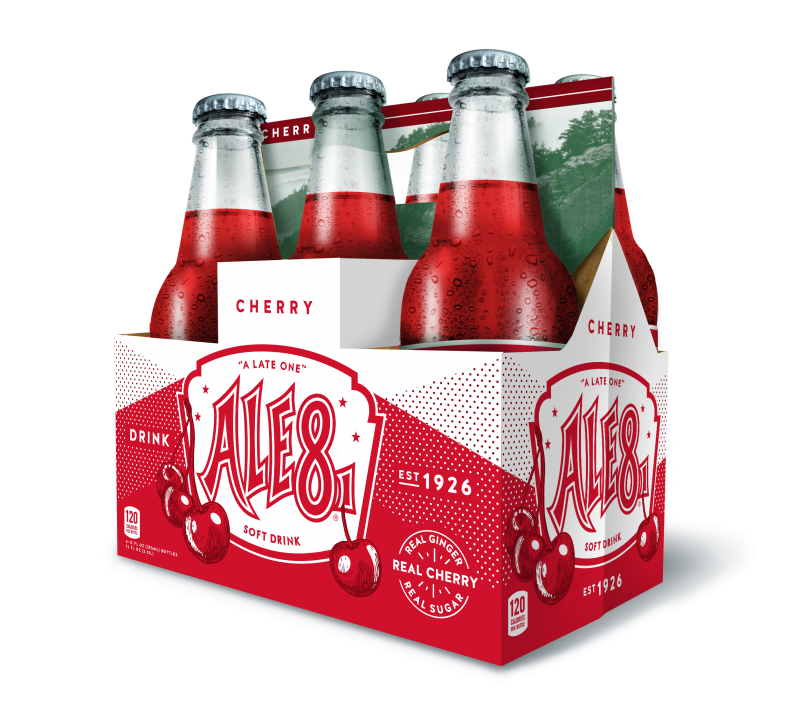 • Ale-8 is widely available in Kentucky, available nationwide online, available in Kroger stores throughout the Southeast, and can be found at most Cracker Barrel, Fresh Market and Harris Teeter stores. • Ale-8-One is a Kentucky Proud member and a three-time winner of Kentucky Living’s Best in Kentucky awards for Made in Kentucky Product. • Recipes for drinks made with Ale-8-One are available online. In the near future, recipes for savory and sweet recipes—some developed by Kentucky chefs—will be added. Watch for them at www.ale-8-one.com. • The online Ale-8-One store and gift shop at the bottling plant in Winchester offer lots of fun logoed merchandise, for all ages, including a variety of t-shirts to onesies. Food items made with Ale-8-One include salsa, barbecue sauce, even suckers! Other popular items include art prints, huggies and bottle sweaters, and seasonal merchandise.